Global action megastar Jet Li unleashes all of his devastating martial arts power in this thrilling tale of a reluctant warrior who becomes a timeless hero! A young swordsmen, Ling Wei (Li), and other followers of the Sun Moon Sect are making a journey to the mountains to abandon the violent swordsman's life. But upon arrival, they find their people are at war! With their leader, Ling must lead a desperate counterattack in hopes of freeing Master Wu and ending the reign of the supernaturally powerful Master Asia and his Highlander clan before it's too late! Packed with incredible martial arts choreography, this endlessly hard-hitting epic is another exciting addition to the phenomenal Jet Li Collection. The Swordsman series continues with the reappearance of the isolated transgender character "Asia the Invincible" to refute those who have used his name for fame and power. 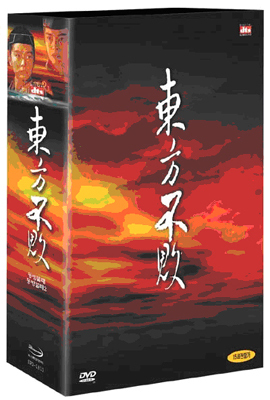 Time, space, gravity, narrative continuity, narrative conceptions about good and evil, and character identity are all shifting, ambiguous threads in the world of The East Is Red--a world governed by an other-worldly set of rules. In other words, if you can't keep up with the story, just let it go. Played out against the conflicts of the Ming dynasty, The East Is Red features spectacular land and sea battle sequences among the Hans, the Sun Moon Sect, the Spaniards, and the Japanese Ninjas. These abundantly violent, wildly choreographed, and edited battles are highlighted by Asia's flying needles and by the protagonists' ability to fly like superhero acrobats as they fight. There's also one very hot (unpleasantly concluded, but hot while it lasts) lesbian love scene. And although Asia is referred to as male, the character is played by a woman. There's no denying the relationship between Snow and Asia, and in the film's queer logic one can't help but read Asia the Invincible as the first transsexual lesbian superhero. A fantastically choreographed, genderfuck Kung-Fu period piece, this sequel to Swordsman II starts in a-blink-and-you'll-miss-it recap of its prequel. The film's protagonist, Asia the Invincible, vacillates between hero and villain throughout the film; Asia's gender and sexual orientation are equally complex.